During the four year’s life span of the project, the consortium will work on modular, personalized medical and ethically acceptable solutions integrated in and around buildings (clinical environments, rehabilitation settings, care homes, and home care), which allow an intelligent prediction (considering both personal medical history as well as real-time gathered data from a series of embedded sensors) about the health status of people/patients. Based on forecast and analytic algorithms REACH will allow to provide novel, personalized interventions (customized services, products, and equipment for mobilization and rehabilitation, physical activity, training, food and nutrition, mobility, and patient motivation). The “Touchpoints and Engine concept” states the REACH system architecture high-level description and will further guide the detailing of the REACH system architecture and its comprising subsystems. The “Touchpoints and Engine concept” structures the envisioned REACH product-service-system architecture, into seven manageable research and development clusters (Figure 1-1), as following: five clusters of “Touchpoints”, which represent any tangible connection between users (seniors, informal/formal caregivers, physicians etc.) 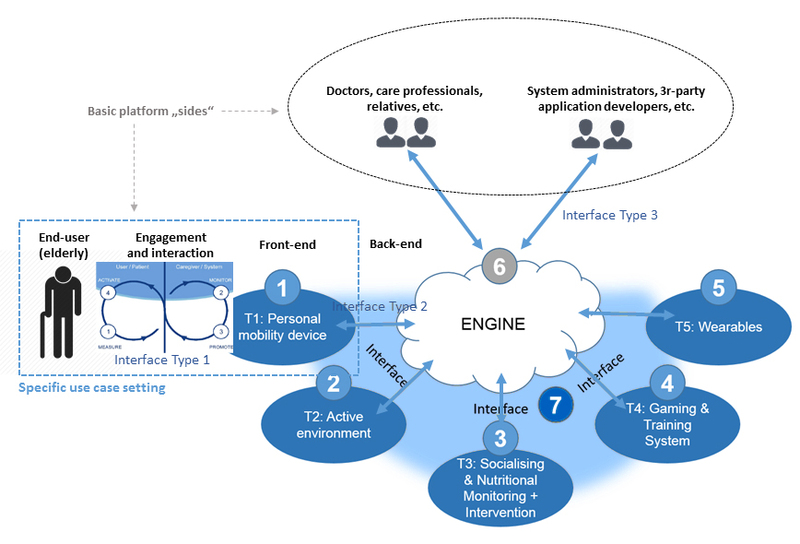 and the REACH system; one “Engine” cluster, which represents the cloud based digital platform; and the “interface” cluster, which represents a set of specifications that allows Touchpoints and other products/services to connect/interact with the Engine. Each research cluster is associated with a separate development team made of consortium members with a team leader.